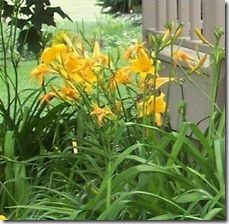 If a section of your garden is being overrun by daylilies, this is the article for you. It is easy to separate and transplant overgrown daylilies to another part of your garden. The first thing that you have to do is to dig up the clump of daylilies with the spade. You want to dig an inch or two away from the base of the lilies, and you want to dig as deep as you can, so that you do not chop off all of the roots. When you have dug up your clump of lilies, you want to separate them. To do this, grab a lily near the base, and gently shake the lily back and forth until the roots come free from the clump. Don’t worry if you rip some of the roots off. The healthy roots are white and bulbous. You may see long, yellow roots on the lily. These roots are dead and can be trimmed. Once you have separated the lily from the clump, you have to trim the leaves. You should cut about five inches above the roots. Because you are uprooting the lily, the roots are sustaining trauma. The stressed roots cannot support a full grown lily. Cutting the leaves back, allows the lily to survive. Take the lily to the spot you want to transfer it to (preferably in a sunny location). Did a hole about five inches deep. You should be able to completely submerge the roots and a little bit of the stem. Put the lily in the hole and cover with dirt. Make sure that you pack in the dirt around the lily’s roots. If you leave air bubbles, the lily can get root rot and die. After you transplant any plant, you should water the plant. Now you have transplanted your lily. If you do this in the early spring, your lily may bloom the same year, but usually this is a long term investment and you have to wait until next year for your transplanted lily to bloom. Make sure you are transplanting into rich soil. If the soil is poor, consider mixing some topsoil or manure with the soil when you transplant.